Sadiqa Reynolds, president and CEO of the Louisville Urban League, meets with students. 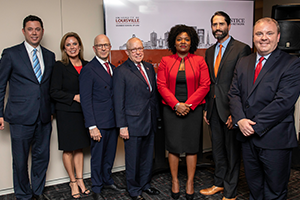 National and state leaders met at the University of Louisville on October 10, 2018, for a bipartisan panel on a topic that often unifies people from all political leanings: criminal justice reform. 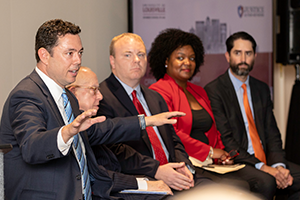 The event was co-sponsored by several local law firms and the student chapters of the American Constitution Society and the Federalist Society. The local support and bipartisan interest in the event were impressive, says Dean Colin Crawford. “As legal educators, we know that the law has real-world impact. This is perhaps no more clearly felt than in the area of criminal justice. 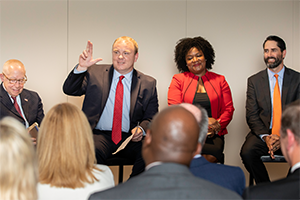 We were pleased to host this event with Justice Action Network that brings together bipartisan leaders to discuss this important issue," he says. At the event, Justice Action Network also announced that it will fund four $5,000 fellowships for Louisville Law students. Professor Sam Marcosson, faculty advisor for ACS, attended the event and praised the turnout. Professor Luke Milligan, a faculty advisor for the Federalist Society, also attended.